ImageMagick is a software suite to create, edit, compose, or convert bitmap images. 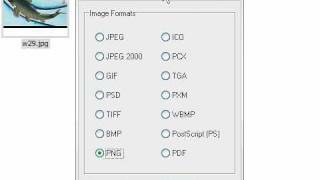 It can read and write images in many different formats (over 100) including DPX, EXR, GIF, JPEG, JPEG-2000, PDF, PNG, Postscript, SVG, and TIFF. Use ImageMagick to resize, flip, mirror, rotate, distort, shear and transform images, adjust image colors, apply various special effects, or draw text, lines, polygons, ellipses and Bzier curves. The functionality of ImageMagick is normally used from the command line or you also can use the features from programs written in your favorite language. With a language interface, use ImageMagick to modify or create images dynamically and automagically. Download and install ImageMagick safely and without concerns. Transform: resize, rotate, crop, turn or cut an image. Transparency: render portions of an image undetectable. Text & comments: insert illustrative or artistic text in an image. Image identification: describe the format and characteristics of an image. Generalized pixel distortion: correct for, or induce image distorted shapes including perspective. Morphology of shapes: extract features, describe shapes, and recognize patterns in images. Delineate image features: Canny edge detection, mean-shift, Hough lines. Motion picture support: read and write the common image formats used in digital movie work. Perceptual hash: map visually identical images to the same or similar hash-- useful in image retrieval, authentication, indexing, or copy detection together with digital watermarking. Color management: precise color management with color profiles or in lieu of-- built-in gamma compression or expansion as demanded by the colorspace. High dynamic-range images: accurately represent the wide range of intensity levels found in real scenes that range from the brightest direct sunlight to the deepest darkest shadows. Encipher or decipher an image: convert ordinary images into unintelligible gibberish and back again. Threads of execution support: ImageMagick is thread safe and most internal algorithms execute in parallel to take good advantage of speed-ups offered by multicore processor chips. Distributed pixel cache: offload intermediate pixel storage to one or more remote servers. Heterogeneous distributed processing: certain algorithms are OpenCL-empowered to make the most of speed-ups offered by executing in concert across heterogeneous platforms consisting of CPUs, GPUs, and other central processing units. ImageMagick on the iPhone: convert, edit, or compose images on your own iOS device for example the iPhone or iPad. What do you think about ImageMagick? Download.hr periodically updates software information of ImageMagick from the software publisher (ImageMagick Studio LLC), but some information may be slightly out-of-date or incorrect. ImageMagick version 7.0.8.32 for Windows was listed on Download.hr on 10.03.2019 and it is marked as Freeware. All software products that you can find on Download.hr, including ImageMagick, are either free, freeware, shareware, full version, trial, demo or open-source. You can't download any crack or serial number for ImageMagick on Download.hr. Every software that you are able to download on our site is freely downloadable and 100% legal. There is no crack, serial number, keygen, hack or activation key for ImageMagick present here nor we support any illegal way of software activation. If you like software product please consider supporting the author and buying product. If you can not afford to buy product consider the use of alternative free products. Is it safe to download and install ImageMagick? ImageMagick was checked for possible viruses by various leading antivirus software products and it is proven to be 100% clean and safe. Although, no malware, spyware or other malicious threats was found we strongly advise you to check product again before installing it on your PC. Please note that laws concerning the use of ImageMagick may vary from country to country. Please be sure that you are using ImageMagick in accordance with the law in your country. How do I uninstall ImageMagick in Windows Vista / Windows 7 / Windows 8 / Windows 10 OS? Make sure the "ImageMagick" is highlighted and then make right click, and select Uninstall/Change. How do I uninstall ImageMagick in Windows XP? Make sure the "ImageMagick" is highlighted, then click "Remove/Uninstall." How do I uninstall ImageMagick in Windows 95, 98, Me, NT, 2000? Select "ImageMagick" and right click, then select Uninstall/Change.